Every Tuesday I volunteer in my oldest sons class room as "lunch parent". My boys go to a charter school, so they eat in their classrooms instead of in a cafeteria, so they ask for parents help to watch the kids so the teachers can get a break. It truly amazes me how much TRASH lunches produce!! They have big huge trash cans placed in the hall way for the kids to dispose of their leftovers, and they are always full... sometimes over flowing, by the time I leave! 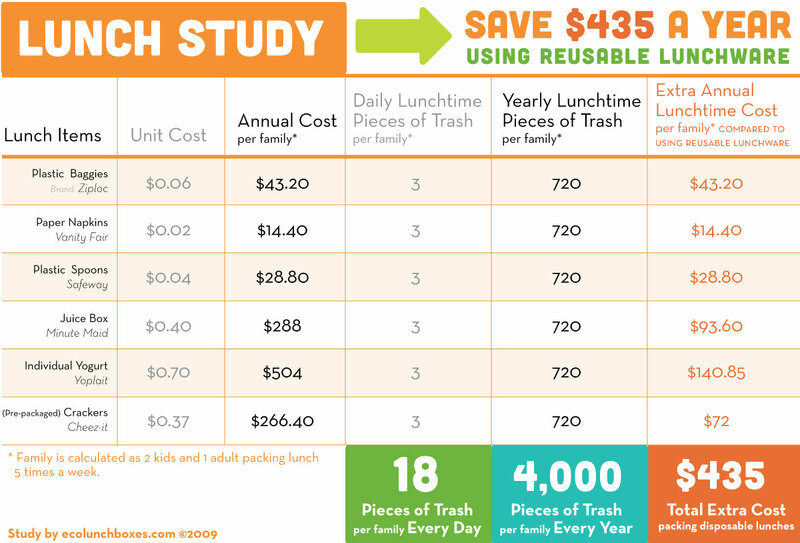 The results of a study by ECOlunchbox show that a typical family wastes about $400 on throw-aways - and also creates approximately 4,320 pieces of garbage at lunchtime unnecessarily every year! “We know green lunches are healthy for people and the planet, but the results of our study strongly show that our pocketbooks are big winners, too,” says Sandra Harris, president and founder of ECOlunchbox. ECOlunchbox calculates that a typical family with two children and one parent packing lunches uses about 9 plastic baggies daily (sandwich and two sides per person) at a cost of roughly 6 cents per Ziploc baggie, adding up to 54 cents spent daily on plastic baggies. That adds up to about $11 monthly and $132 annually. Other “lunch math” to consider is the extra cost of paper napkins, disposable utensils and pre-packaged foods. But plastic baggies are just the tip of the iceberg when it comes to the hidden costs -- both in terms of dollars wasted and the burden to the environment -- of using throw-aways at lunchtime. Good For People: Doctors and researchers have linked BPA in numerous studies to hormone and thyroid problems, behavior issues, obesity, cancer, diabetes, and even kidney and heart conditions. A study published in the Journal of Allergy and Clinical Immunology furthermore suggests there is a strong link between exposure to BPA and the increasing incidence of asthma. ECOLUNCHBOX LUNCH CONTAINERS AND COTTON BAGS ARE BPA-FREE AND PHTHALATE-FREE. Good For Planet: The best way to reduce garbage is to not create it. A waste-free lunch (sometimes called a litter-less, smart, garbage-less, waste-free, no-garbage or waste-not lunch) means that you have no packaging to throw away when you're done. All you’re left with is apple cores, banana peels and other biodegradable extras. A typical American school kid generates 67 pounds of discarded lunchbox packaging waste per school year. That’s more than 18,000 pounds annually for an average-size elementary school, which adds up nationwide to more than 1 billion pounds annually. A typical U.S. family using disposibles generates more than 4,000 pieces of lunch trash unnecessarily each year, according to an ECOlunchboxes Lunchbox Waste Study 2010.